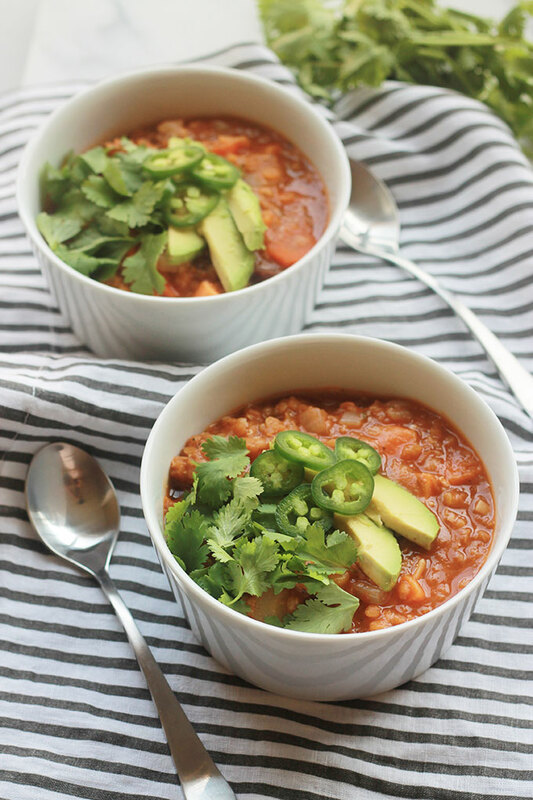 Hearty, comforting and delicious, this Spicy Lentil Sweet Potato Stew with a touch of jalapeño heat is perfect for those cold winter days. 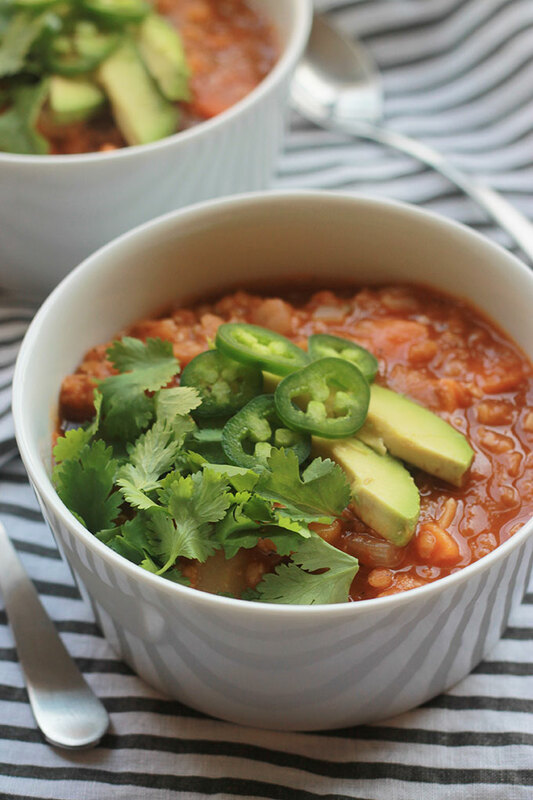 Picture it, it’s cold outside, you have on your coziest loungewear all curled up in front of a warm fire, watching your favorite Netflix or Lifetime movie, while enjoying a big hearty bowl of Spicy Lentil Sweet Potato Stew. This is a perfect dish for those cold winter days and it’s so easy, everything goes into one pot and no complicated ingredients required. 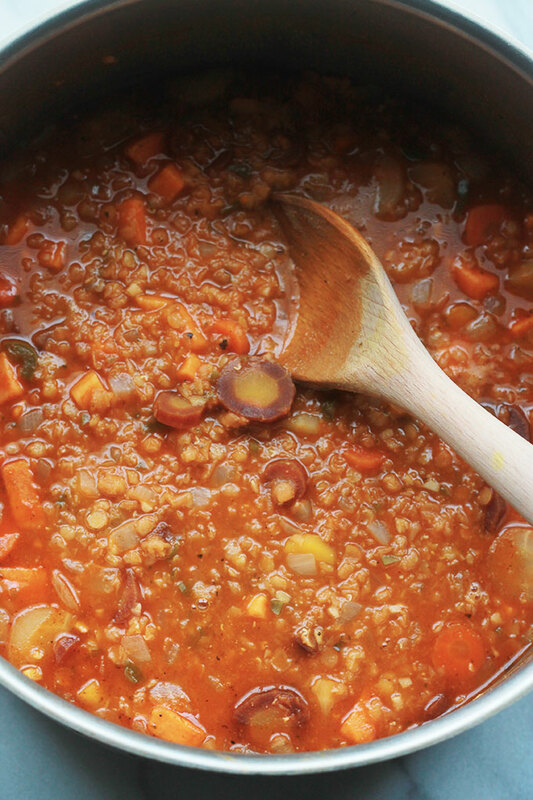 It’s loaded with hearty root vegetables and red lentils. 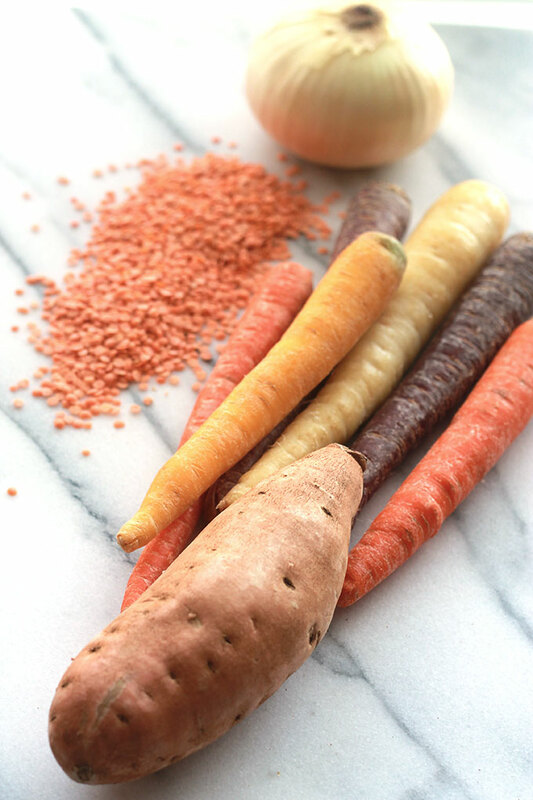 The combination of multi-colored carrots and sweet potatoes is simply delicious with the subtle heat of the added jalapeño. Serve it up with cilantro leaves, sliced jalapeño and avocado and get ready for over-the-top mouth-watering deliciousness! Make a big pot and enjoy the leftovers. 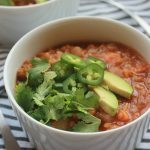 This Spicy Lentil Sweet Potato Stew is even better the next day and the next day after the next day. Heat oil in a large stock pot over medium high heat add onions and carrots to pot, season with a pinch of sea salt and black pepper, sauté until onions are soft and translucent. Add garlic, sweet potatoes, jalapeños and seasonings, sauté until fragrant, about a minute. Pour in vegetable stock and add tomato paste, stir until paste is completely combined. Add lentils, stir, bring to a boil over medium heat once boiling, reduce heat to low, cover and simmer until potatoes and lentils are tender about 20 to 25 minutes. Taste and season with desired amount of salt and pepper. 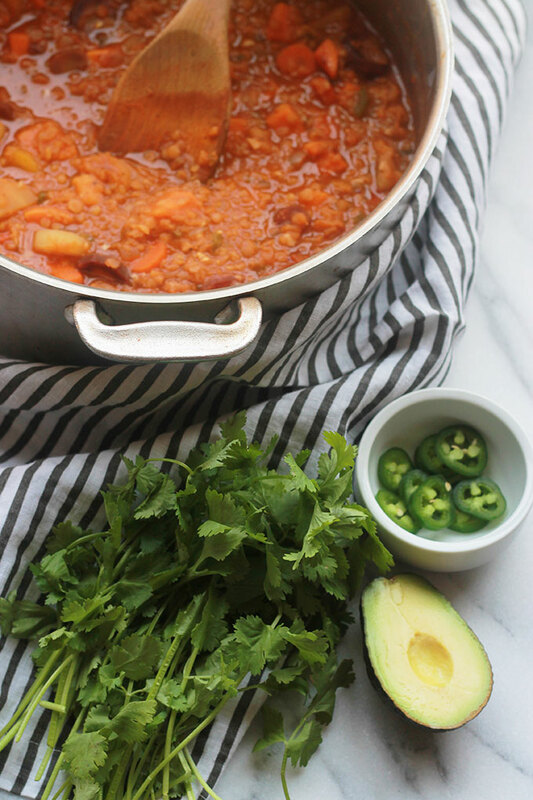 Serve stew with fresh cilantro sliced avocado and jalapeños. If you make this recipe or a version of it, take a picture and share with me on Instagram, tag it #thewholeserving or leave a comment below. 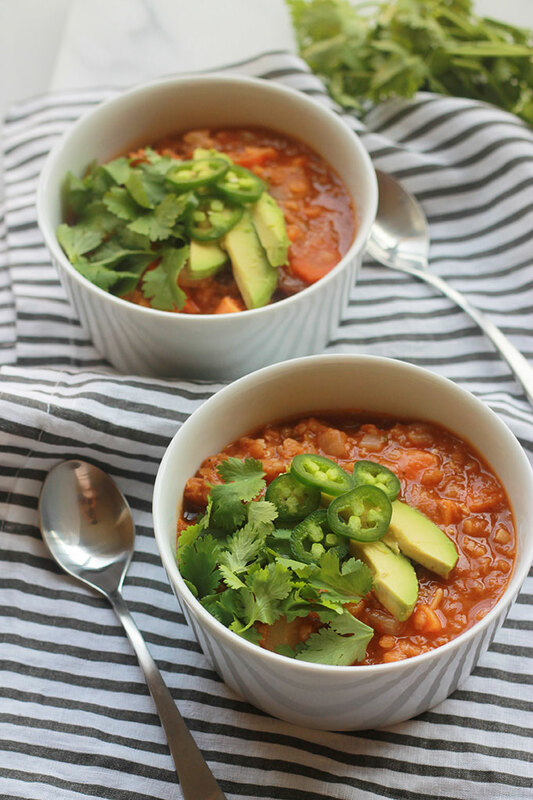 I’d love to see or hear about your version of this Spicy Lentil Sweet Potato Stew. This looks so tasty! My vegetarian family would love this!!! I’m glad you like it and I hope you get a chance to make this soon and it’s a big hit with your family. I love making nourishing soups like this one! I especially love the inclusion of jalapeño pepper! I usually add hot sauce to my own bean and vegetable soups! 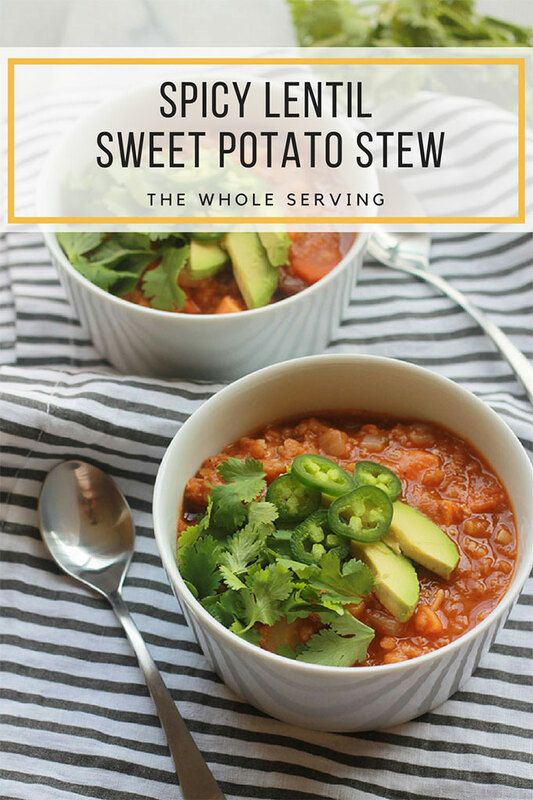 Thank you so much for sharing your hearty and delectable Spicy Lentil Sweet Potato Stew at the Healthy Happy Green and Natural Party Blog Hop. I’m pinning and sharing. Wishing you a healthy, green and natural year ahead! Yum! This looks amazing! Thank you for sharing, Celeste!